I purchased tickets for an event and needed to sell one so I had to extract a single page and forward that to the buyer… but there are many reasons why you’d want to do this. There are lots of pdf editors out there but the task is far simpler than installing new software that you have to learn. A much simpler way is to install a pdf printer driver and print part of the file to a new pdf. The file will then be saved with the pages you selected to a pdf at a location you specify. This entry was posted in Uncategorized on September 13, 2017 by Cian Foley. We recently did an SEO audit and training session with Brennan Catering Supplies, who specialise in selling Hygiene, Bar & Catering Equipment in Ireland, from Chefs Clothing to Coffee and Espresso Machines. The site has thousands of catering products so we began our test by scanning the site technically looking at current position on search engine for various catering products and looked for areas to improve the content, looking at uniqueness of titles, headings, image alt tags and site content in general. We researched their product sitemaps and verified that products were being indexed correctly, looking for potential issues and analysed competition to see how Brennan Catering Supplies other catering equipment companies were comparing with them. We also looked at things like page load speed, errors, mobile compatibility, back links and other factors that might affect their SERP. We presented a strategy for them to improve content and online marketing going forward and hopefully, given time, they will see some significant improvements and see their hygiene, bar and catering supplies products shooting up the ranks on the search engine results pages in the near future. This entry was posted in Clients on February 18, 2016 by Cian Foley. 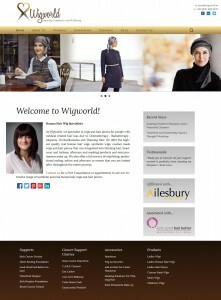 When Joyce O’Carroll contacted me to re-build her new Wigworld website she asked me to create something clear and stylish that worked well on both mobile and desktop computers. Wigworld specialises in wigs and hair pieces for people with medical related hair loss due to Chemotherapy , Radiotherapy , Alopecia, Trichotillomania and Thinning Hair. There were many products listed in galleries and we decided to present them with a pinterest type gallery. We used plugins to extend the default gallery with a lazy load gallery using lightbox effect when images are clicked. This provides a nice way to view thumbnails at a glance and allows the user to scroll through in an intuitive way on mobile and desktop without using unnecessary bandwidth. 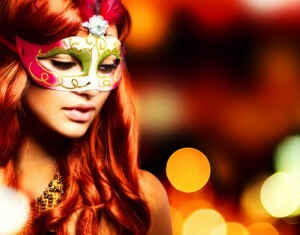 It also allows Joyce add new images easily. The site uses a slider for the header which can be easily updated with new images also. There are several wordpress plugins installed to make the site work well with google in terms of Search Engine Optimisation (SEO) and also with Social media through social share buttons. We also installed plugins for security to prevent hacking and unauthorized login attempts. “I’m thrilled with my new website its clean and clear just as I asked for. I didn’t want a clutter site like so many others. Cian understood my vision. He was professional ,ease to work with and interested in my wishes! This entry was posted in Clients on January 26, 2016 by Cian Foley. 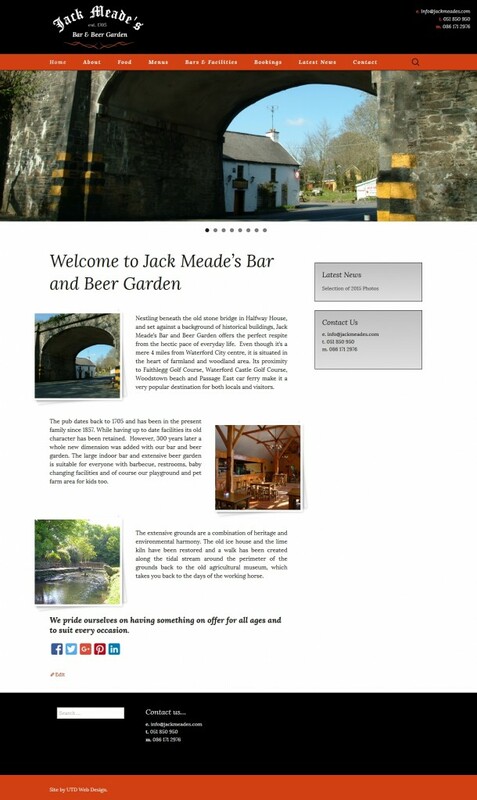 I was delighted to be asked to redesign the Jack Meades Bar & Beer Garden website. We originally designed the site over 5 years ago before responsive design became mainstream. The site was indexing well on Google but wasn’t mobile friendly so I was chuffed to be asked to redesign the site by Liam Hartley and bring it up to date. Liam wanted more traditional colours for the site too and a more striking logo so we went for black on white with a little red motif using the traditional lettering from the old logo and a red menu bar to perhaps reflect the extensive hurling tradition of the area. The site is clean and crisp and a lot more striking now, and as per usual clutter free. We want the site audience to get the information they need without fuss. The site is built with wordpress so came with blog/news by default and the slider we used brings you through the grounds from the famous tunnel at Halfway house, around the grounds to see the extensive facility including the old bar, the main bar and beer garden, the kids playground and the historic lime kiln and beautiful grounds. This entry was posted in Clients on January 21, 2016 by Cian Foley. Yes you read that right! I have to keep saying it out loud because it’s still surreal. 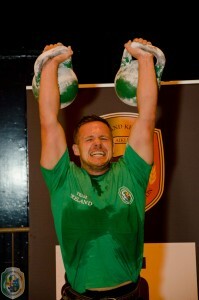 I’m a World Kettlebell Champion fulfilling a dream of mine for a number of years. After winning the Europeans in my category (adult men’s long cycle, 78-85kg bodyweight with 2x24kg bells) this year, I was quietly confident going into the worlds knowing that if I trained hard, cleaned up my diet and got a bit more clever about what I was doing with my technique, I could increase my repetitions and be in with a chance of winning. My coach Rosaleen Flynn (Rosie is coach at Waterford Kettlebell Club based at Peak Fitness in Cleaboy business park in Waterford) put together a periodisation plan for me and knew when to push and when to lay off to get me as prepared as possible for D-Day. 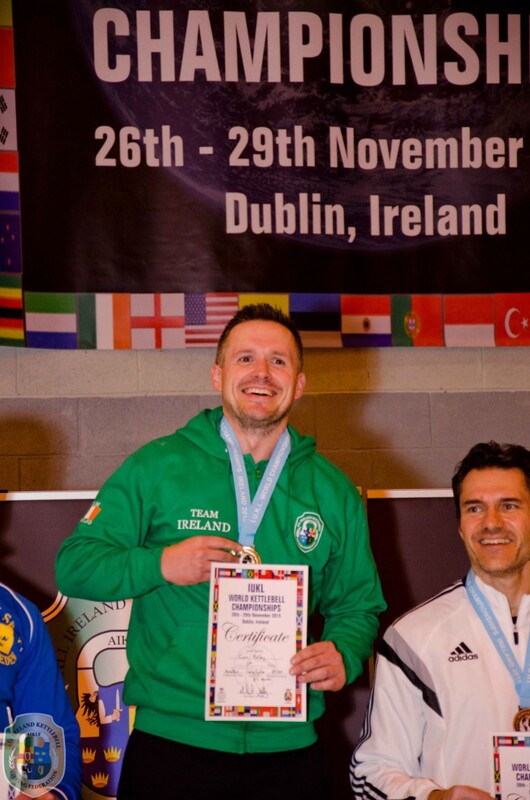 Between the 25th and 29th of November, the IUKL World Kettlebell championships were held in Ireland in DCU’s sports complex in Dublin and run by the AIKLF. Kettlebell Sport (or Girevoy Sport), is a Russian sport where athletes compete with one or two kettlebells (16, 24 or 32kg) for 10 minutes with the aim of getting as many repetitions (reps) as possible. 565 athletes attended the event from 36 countries, which means it was the biggest kettlebell event in the world to date. I’m especially delighted to have won a gold medal in Ireland. That made it really special because my family and friends were there to give support. My wife Nic, the kids, my mother and father, my father in law, sister in law, sister, god son & niece and pal Burkie and his wife Juneanne, along with my fellow club members were all there. I really appreciated everyone being there and heard them during my set, you can hear them shouting in the video above. 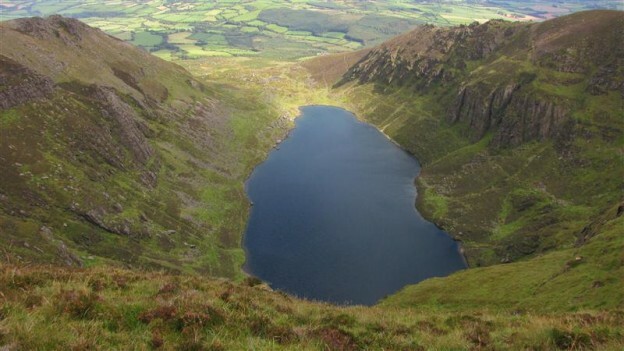 I had to give absolutely everything to get those last 2 reps to win and all the running up and down to Coumshingaun and jumping into the lake for months may have been the difference, thank God. In terms of big wins for me, I won a European medal in Bulgaria in July of this year and won the Pan American Open Championships the year before in Columbus Ohio at the Arnolds, but this is the biggest for me so far. It’s very satisfying to set a goal and then achieve it. Big thanks to my wife Nicola and children for giving me the time to train and support needed to focus on the event. Thanks to my training buddy Kieran and his wife Cathy for opening up their gaff for me to train during the winter months. Finally, thanks to my coach Rosie from Waterford Kettlebell Club who put together an excellent training plan for me. It obviously worked! Waterford Kettlebell Club is based in Peak Fitness in Cleaboy Business Park. If anyone is interested in getting involved or finding out more about Kettlebell Sport in Waterford please contact Rosie or any of the lads in there and they’ll point you in the right direction. It’s an amazing second chance for me to have gone from being an 18 stone unhealthy slob to <13 stone kettlebell lifting athlete over the past few years. It was a slow progression but I’m delighted that I got on to that path and how far I’ve come. If you told me 5 years ago that I’d be a European and World Kettlebell lifting champion in 2015 I’d have laughed in your face so I guess what I’m saying is that there is hope for everyone, if you have belief in yourself and are willing work hard. Now back to the real world, website anyone LOL? This entry was posted in Nothing much ado about Websites on December 17, 2015 by Cian Foley. 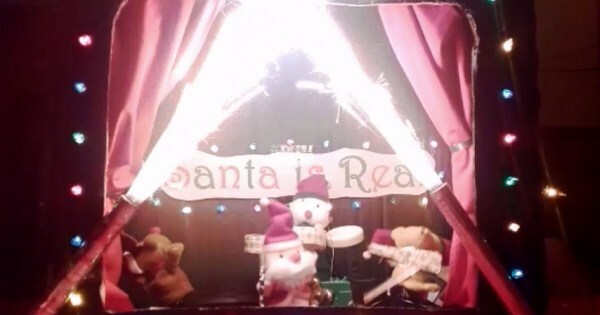 Santa is Real is about remembering back to when I was a child waiting up in bed to catch Santa Claus coming into my room. One Christmas eve I could have sworn he came in and rubbed my sleepy head. Each Christmas eve I’d stay awake to see if he’d come into my room again and I heard noises on ceiling which I presumed was the sleigh thumping off the roof. Sadly as the years went by, I forgot about Santa and the magic of Christmas and I grew up. Merry Christmas and a Happy New Year from Waterford Web Design! This entry was posted in Uncategorized and tagged christmas, holiday, santa on December 16, 2015 by Cian Foley. We recently put together a new site for Dermot O’Brien in Sallyfort Farm, in Stradbally Co. Waterford. Before I started to build the site I went for a visit to the farm to get a feel for the place. The view of the Comeraghs was the first thing that struck me. A magnificent panoramic view of the entire range from east to west. Dermot then showed me around the farm, the huge indoor area, the farm itself with all the animals, the milking parlour out the back and he took me for a spin around the fields in the tractor. He then took me for a brilliant spin through the countryside in his Fire Engine…. Yes, Dermot took me on what I can only describe as a Safari around Stradbally, listing to music blasting away. We went along the coast to Ballyvooney and through narrow winding country roads in a Fire Engine with the siren going. Surreal, but some crack. So what’s this got to do with Hen Nights? Well, the main reason Dermot upgraded the site was to add in a service for Hen Parties with a difference. 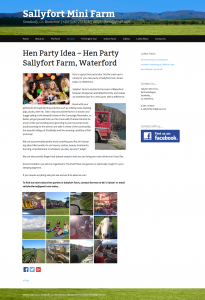 If you’re organising a Hen Party it might be worth your while visiting the Hen Party ideas page on the Sallyfort Farm website and then talk to Dermot. You can do anything you like on site, organise food, games, drinks, beauty treatments, pet animals, go beserk on bouncy castles, milk cows, dance, take in the breathtaking views and go for a mad spin on a fire engine with Dermot. 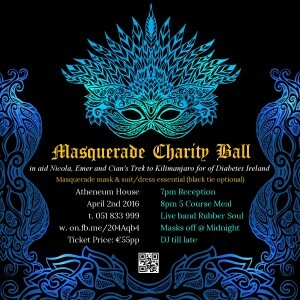 You’re in between Waterford City and Dungarvan too so you have options with regards to having a night out on the town also. This entry was posted in Uncategorized on November 9, 2015 by Cian Foley.